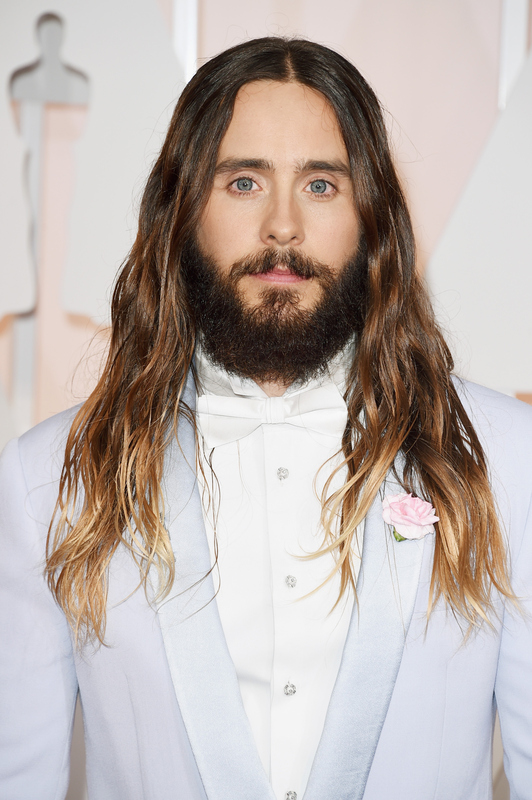 Jared Leto has been known to make some fashionable fashion decisions on and off the red carpet. I mean, I think we all knew he definitely wasn't showing up at tonight's Academy Awards in a tasteful tuxedo like many of the other men at the star-studded event. When Twitter started talking, I had to see it for myself and was ready to roll my eyes at what was sure to be yet another attempt by Leto at being edgy. But I'm just in love with his pastel purple suit. Yes, Twitter: I'm telling you that you can shut it and keep your jokes about 80s Bar Mitzvas and Dumb and Dumber to yourselves. The dude does not like to be confined by what's deemed socially "appropriate" for certain events, that's for sure — and his pastels are totally something a "bad boy" in a teen rom com would wear ironically. Still, taking into consideration that it's a well-cut suit, that the color looks great on him and that it would appear that he actually combed his hair and beard for once, I'd call this a win. Leto also managed to pull off white shoes without looking like a douchebag-y bro and his pink carnation was a cheeky nod to the retro feel of his suit without going into full kitsch territory. Pastels and other muted tones are likely going to be huge for spring and even though he eschewed the jewel tones that other men opted for, he looks totally on-trend. I'm calling this one, guys. He nailed it.